Started by Rotary. 99.99% there. District Event: The District is holding its annual GRSP Information Evening at the Chaplaincy Centre, Heriot Watt University, Riccarton Campus on Thursday, 25th April 2019 at 7.00-9.00 p.m.
RC Motherwell & Wishaw For a Registration Fee, members of the Club will support cyclists, riding to raise funds for named charities. Participants in the Callander Cycle Challenges – 2016, 2017 & 2018 raised well over £50,000 for various excellent causes. RC South Queensferry Come and join us for the annual gathering of golfers at Dundas Parks Golf Club, South Queensferry, in support of QCCC. RC Penicuik Wine, a finger buffet and many prizes to be won. Much more than just a Wine and cheese evening. All the fun of the fair. RC Selkirk Our Annual President's / Charter Evening, which will be held in Selkirk Rugby Club. District Governor Agnes presents district winners in the Young Writer and Young Photographer competitions with their certificates. A very high standard was achieved again this year, with the judges being very impressed with the entries. The District final had 16 Competitors and the standard of musicianship was amazing. The weather happily did not put off an enthusiastic audience from attending and enjoying a splendid afternoon. The adjudicators had a really tough task in deciding on the winners! 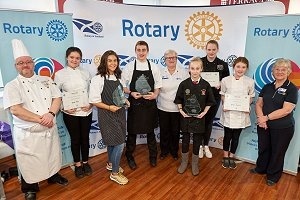 The Scottish Rotary Districts sponsored the championships for the Fifth year in succession with the opportunity to get some great publicity and to have a strong Rotary presence at the arena during the two days. The games took place at the Emirates Stadium in Glasgow on Wednesday 6th February and Thursday 7th February 2019. 204 schools across Scotland were represented. The athletics were superb, and there were Rotary banners around all the stadium and surrounding the podium. Click More to see some highlights. The District Final of the Young Chef Competition took place on Saturday 2nd February at West Lothian College. 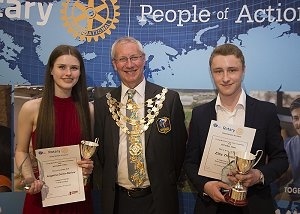 The first two were Stephen and Maya, both sponsored by the Rotary Club of Kirkcudbright. Third place went to Maisie, sponsored by the Rotary Club of Peebles. Stephen and Maya will represent the District at the Regional Final on 2nd March. Congratulations to them. All competitors produced some very tasty dishes (just ask DG Agnes) and were praised for their standard of cooking by the judges. It was good to see a number of Rotarians at the competition supporting their candidates. The first leg of the annual Rotary Harry Rankin Fishing Competition will take place again at The Lake of Menteith on Monday 3rd June, the second leg is Monday 2nd September 2019. This friendly competition is open to all Rotarian’s in Scotland,District 1010, 1020 and 1230, a day of good fishing and good fellowship. The latest edition of the District's online newsletter can be seen here. You may remember that one of only two Peace Fellows honoured at the United Nations Rotary Day this year was Kiran SIngh Sirah, a member of our GSE team which went to Colombia in 2009, and subsequently a Peace Scholar sponsored by the Rotary Club of Tranent. 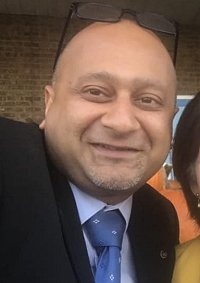 Many people in the District remember Kiran fondly, and we are delighted that he had now joined Rotary as a member of his local Rotary Club in Tennessee. In his post on Facebook he paid tribute to Ian and Olive Geddes for their support and encouragement as a GSE scholar and a Peace Fellow, and shared the story of their friendship at his induction - followed by a drink in Ian's honour. 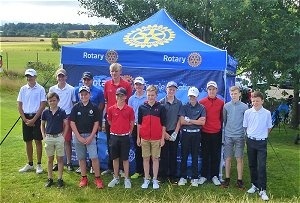 The District Young Golfer competition was held at Kingsfield Golf Course, Linlithgow on 2nd August 2018. The winners can be seen here. 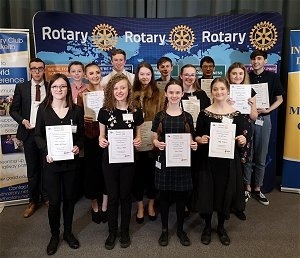 The grand final of the Rotary in Britain and Ireland Young Musician competition was held in Scotland for the first time this year, hosted by the Rotary Club of Currie Balerno. The audience heard an incredibly high standard of performance and musicianship, in the setting if Heriot Watt University. RIBI President Den is Spiller presented the prizes to the two winners, one vocal, one instrumental. Peter Croan (Galashiels Rotary Club) has been awarded one of the 12 RIBI Champions of Change awards. He was nominated by DG Lindsay for his work in securing medical units for Pakistan (10 former NHS Scotland breast screening trailers sent to Karachi in July/August 2016 and one trailer sent to Dhaka in Bangladesh in Summer 2017). He received his award in Cardiff on 18 May. 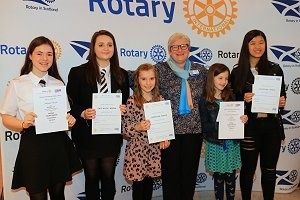 At this year's Rotary Young Citizen Awards, two of the awards went to young people nominated by clubs in our district. Joseph Cox was nominated by Leith Rotary Club for taking action to help rough sleepers, and Ryan Montgomery was nominated by Corstorphine Rotary Club for his initiative in setting up Cortorphine Emergency Response. You can watch the awards below, and find out more about these remarkable young people by clicking "more". A project in the Philippines spearheaded by Selkirk Rotary Club and supported by the Rotary Clubs of Hawick, Langholm, Kelso, Melrose and Galashiels,was recently featured on ITV news. You can watch the item below. 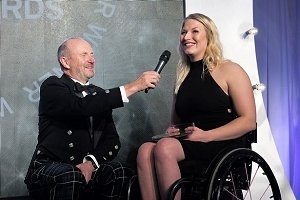 Wheelchair racer and Honorary Rotarian Sammi Kinghorn believes being the first para athlete to be crowned Scottish Sports Personality of the Year will change attitudes for ever. The award tops a great year for Sammi in which she won two golds and broke a world record at the world championships. Sammi, from Melrose and an Honorary Member of the Eclub of Southern Scotland, has switched to marathon racing so she can represent Scotland in the Commonwealth Games in Australia in 2018. 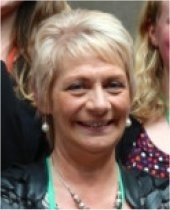 She is certainly doing Scotland and Rotary proud. District 1020 Peace Officer Jean Best was one of only six Rotarians and Rotary Peace Fellows around the world to be honoured at this year's Rotary Day at the United Nations in Geneva. Not only that, but one of the two Peace Fellows honoured, Kiran Sirah, was a member of our GSE team which went to Colombia in 2009. Subsequently he was suggested as a Peace Scholar and sponsored by the Rotary Club of Tranent. For one District to be associated with two Champions of Peace in a single year is probably unique and our congratulations go to Jean and Kiran on this well-deserved recognition. You can see both of them at the opening session on UN Web TV below (from 51 minutes), introduced by John Hewko, RI General Secretary. 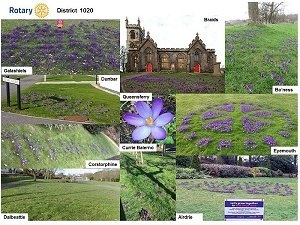 Clubs across D1020 have been planting crocuses as part of the Purple4Polio campain to raise awareness of the fight against polio. You can see a slideshow of some of them in the Foundation section. Could you be a Rotarian? Is Rotary for you? Have a look at this and see. If you think it is, why not contact a local club? District 1020 covers the south of Scotland from coast to coast and from the Forth to the Borders.